At last the Raspberry Pi reached, after a really long wait. In fact I even forgot about the ordered date and to my surprise it reached yesterday. When I un-boxed the RPi realized that I haven't order the power supply. But to my wonder it doesn't need a wait, for that you can use any of your mobile chargers which has the micro USB connector with 5v power supply. Luckily, I have few which came with multiple gadgets. I can dedicate of them to these tiny one. 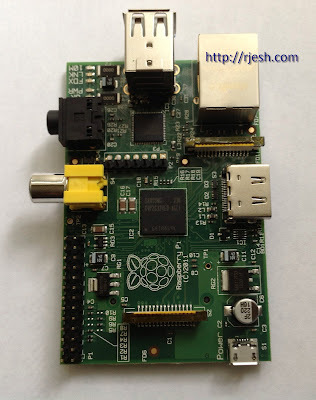 Now some info on the Raspberry pi, RPi is a single board computer which is small in size (Normally its widely written its credit card size computer, I wont say that its litter bigger than the credit card :-) when connected with SD Card and other accessories, just kidding) Which has HDMI slot, RGA, USB, Ethernet Port. You can use this computer for wide range of ideas. And main thing its cheap just $25 for Model A and $35 for Model B. Now coming back to my day 1 experience, you read about the RPi in their site or in wiki. At the time of ordering, I know there was 256 MB Ram version alone but later came to know there exists the 512 version also. So quickly want to check on my piece whether its 256 or 512 Ram. I have not prepared my SD card with the OS image to boot. Need to find the Ram size with out booting, it was simple after reading through other RPi owners blog. If you look into the picture above(click on the image to zoom), in the center there is a chip with Samsung written on top of it and there is lengthy string below that. If you can find 2G in that, then its 256 MB Ram if you see 4G in it then its going to be the 512 MB Ram in your board. Whats next, I already own a full sized SD card going to load the Raspbian linux distribution in it and then try to boot the RPi for the first time. Just curios to see the boot up in the large LED screen. And will be trying with the other features like adding the WiFi dongle to board and the need to find a way to connect by K400 wireless Logitech keyboard. I'll be writing about my further experience with the RPi.